For those of you who are aware of my puppy love for peanut butter, this Peanut Butter and Jelly Pancake post probably doesn’t come as a shocker. 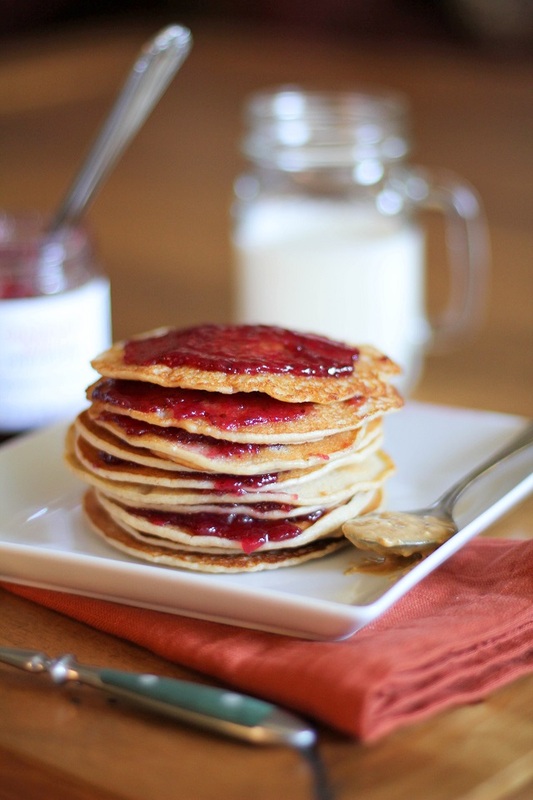 Peanut butter and jelly mixed right in to your pancake batter. Haazaaaaaaah! Topped with…more peanut butter and jelly! All peanut butter and jelly sandwiches should be made out of pancakes. Peanut butter and I have a grade school relationship. We hold hands on the swing set when no one’s looking but in public view, we avoid eye contact. I pretend I don’t care and play it cool while PB gives me the run-around –putting on a chase one day and the next day finding some other pig-tailed red head to be the object of its affection. That’s so typical PB. It’s coy. And devastating. Whyyyy, peanut butter, whyyyyyyy? This, my friends, is Week 8 of the Pancake Project. I have to confess, I was going to make this week my last week of the project. I even wrote an entire pancake farewell post and then tucked it away for later because I simply have more pancakes to give. To you. Let’s not sugar coat this, I’ve got more pancakes to eat, mmmkay? Mmkay. Each week brings new flavors and fun but this week’s recipe is by far my favorite. On account of the peanut butter. And the jelly. Pancakes and I seem to renew our vows every week. The haps with this batter dog, other than peanut butter and jelly being all mixed up in its grill, is half almond meal and half brown rice flour. WINNER! The texture, consistency, the love…the touch the feel of pancakes, the fabric of our lives. No really, almond meal and brown rice flour mixed together is a splendid gluten free merriment. Sir Bob and his Red Mill have a gifty gift for one lucky reader. Have you tried using brown rice flour? Did you know brown rice flour makes an obnoxiously wonderful pancake? For a chance to win a bag of Bob’s Red Mill Brown Rice Flour, just leave a comment on this post. The winner will be randomly selected and notified through email Wednesday, March 6, 2013. It takes two to make a thing go riiiiiight! Let’s play the ol’ stack and cram. Okaaaay, twist my arm. In a small saucepan, add the milk and peanut butter. Heat over medium and stir just until the peanut butter is somewhat combined and is no longer a big hunk. This should take but a few seconds. Allow this mixture to cool slightly. In a mixing bowl, whisk together the egg and the milk/peanut butter mixture. In a separate bowl, stir together the almond meal, brown rice flour and baking powder. Pour the flour mixture into the wet mixture and stir until combined. Add the jelly and mix into the batter. In a large skillet, add just enough oil to coat the bottom and heat to medium. Once the skillet is all the way hot, measure a scant ¼ cup of batter and pour it carefully into the pan. The batter will spread and sizzle around the edges. This is normal. Allow pancake to cook until little air bubbles rise to the top and the sides firm up. Flip to the other side and continue cooking another minute or so, until pancake is cooked all the way through. I am seriously obsessed with the simplicity and tastiness of a PB & J sandwich…it may be a bit unhealthy! 😉 You can only imagine, then, that these pancakes sound absolutely delicious to me. Thanks for sharing :). all of my favorite flavors combined into one beautiful stack of pancakes! This is genius lady! PB&J for breakfast? Yes please. I am totally obsessed with your pancake project. Best project I’ve eeever heard of! What a chic presentation! Deliciousness soon to follow. Well since I’ve had my gallbladder out a week ago, I’ve made it my goal to incorporate grains from Bob’s into every day, sometimes 2-3x a day! It’s sure helped me feel better and healthier. I’m looking forward to trying a few more flours when I get to baking, making pancakes! This recipe is awesome. I’ll make it for my husband as soon as I can round up the ingredients. Thanks for your fun blog posts. I love PB & J, what scrumptious pancakes! Yum! And again, I say, YUM! I love your pancake project idea 🙂 And these look perfect!!! Conditioned response guaranteed ;). Who would have thought they are made out of gluten free flours. I love using brown rice flour in my baking, good to know that it pairs great with almond meal in pancakes (I’m still worried it may not end up well without the magic that egg does in the dough). I gotta find and try that Cranberry&Vanilla jelly…yum! Thanks so much, Anna! I’m continually surprised by the versatility of gluten free flours. They definitely take a little getting used to but they’re so much fun and make you feel strong as opposed to sluggish (which is how I feel with wheat flour). The Cranberry Vanilla preserves are TO DIE FOR!! I think it’s a seasonal product but everything I’ve tried from Kelly’s Jelly is delicious. You can buy their stuff online here: http://www.shopkellysjelly.com/ Maybe try emailing Kelly to see if you can get ahold of the Cranberry Vanilla…she’s a reaaally sweet lady!! Hi Anna & Julia! First off Julia, these pancakes look amazing!! Anna, we can get you some of our Cranberry Vanilla Preserves, email me direct! We love pancakes. We love peanut butter. We love jelly. Yummmm. Thank you for all of the amazing pancake recipes! Love them! 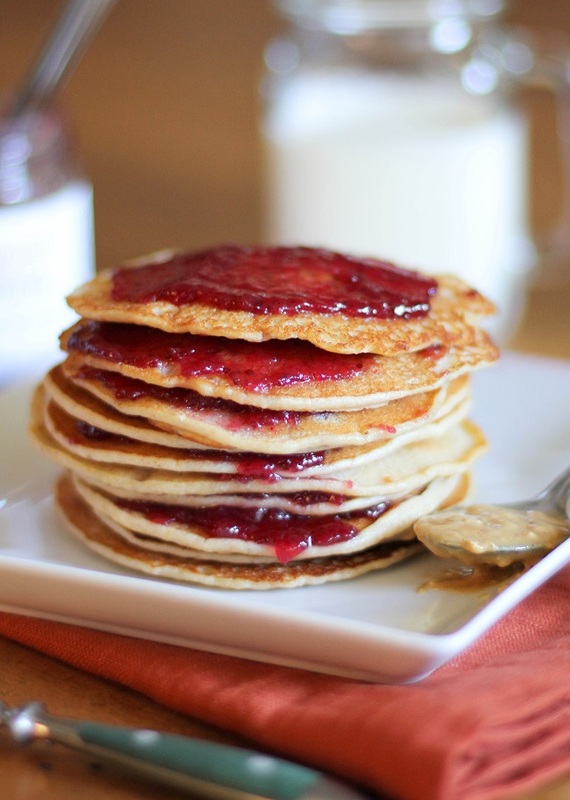 I love pb & j, therefore, these pancakes are a must have in my life. I will be making them this weekend! I buy salmon flour and coconut flour from Bob all the time, and have wanted to try the brown rice flour (I only use brown rice at home), so this is the perfect opportunity. Thank you for the recipe and the contest. I never ate PB&J as a kid because I didn’t like it. Now I LOVE it. These pancakes look delicious! And again this week, as it has been the previous weeks – beautiful! And that jam is gorgeous! LOVE this idea! I’ve been making mine with sourdough starter mix and whole wheat flour, so this would be an awesome change. I tried your recipe for almond flour pancakes last weekend, but I would love to try brown rice flour! love Bob’s!!!! These pancakes look fantastic!!! That’s definitely one of the beauties of Bob’s Red Mill! They make flours and meals out of all sorts of nuts and grains which makes gluten free options virtually endless! Thanks for stopping by, Crystal!! Just when I thought pancake Friday’s couldn’t get any better. I LOOOVE peanut butter (and almond butter does not cut it). Michelle, I’m so glad you weighed in about the almond butter! Almond butter certainly has its place but Almond Butter and Jelly just doesn’t have the same ring to it (nor close to the same wonderful taste!) 😉 Thanks and have a great weekend! I really want to try this! 🙂 Looks delicious! My mom used to make pb&j bread. I’ll have to make these pancakes for her! I really like your bog! I love finding new healthy blogs and I will definitely make this tomorrow morning!! This recipe just blew me out of the water! 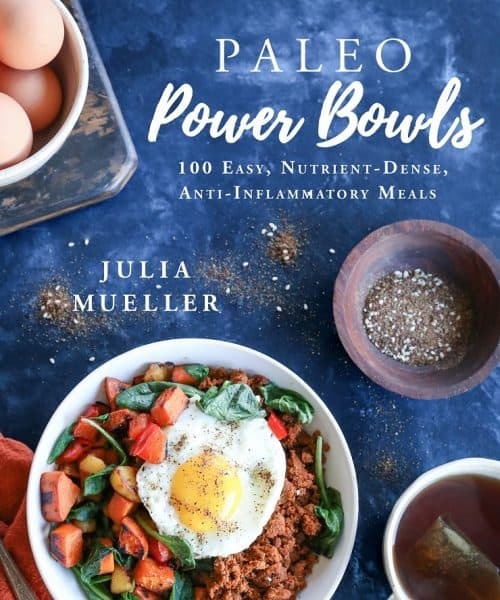 Brown rice flour– how clever! Pinning this and telling friends about this fantastic idea. I love pancakes and I am so excited to try all the ones you posted. 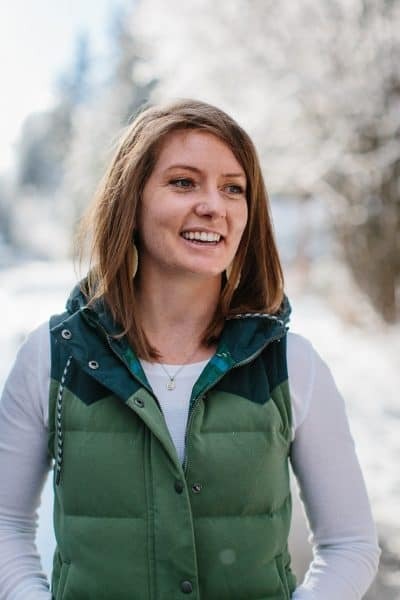 I am heading back to Oregon where Bobs Red Mill is -in a week to pick up a bunch of his many gluten free flours to try. Thanks for all the awesome gluten-free versions of pancakes! These sound great. Will have to try them. These pancakes look delicious. I love peanut butter and jelly but never tried them together. That was clever..thanks for coming up with the idea. Yum!! I love peanut butter and I LOVE pancakes! Omg…your pancake project is killing me. I might have to try all of them! I love Bob’s Red Mill anything…awesome giveaway. I’ve never used brown rice flour but have used Bob’s Almond Meal. Your stack looks great. I just canned some strawberry preserves yesterday that would go great with those cakes. We have a berry patch in the yard but I bought them at the store, it’s winter here! Thanks for the opportunity to score some Bob’s Red Mill, great company, awesome products! I’ve tried almond butter, cashew butter, sunflower butter but I always go back to peanut butter. Nothing comes close to the taste of peanut butter. If you have a peanut allergy you don’t have any othhim.er choice but to eat something else. But for me peanut butter on everything. I was making peanut butter pancakes 25 yrs ago. I have never tried them with jelly. Of course back then I used wheat flour. Now that I know I have celiac disease I only use gluten free flours. I use rice flour for alot of things, pancakes being # 1. We have pancakes every saturday morning. Bobs red mill is my favorite. Good products and Bob seems to be a great person from what I have read about him. 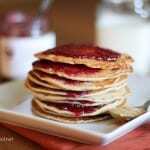 I love the idea of peanut butter and jelly pancakes! Great idea! I’ve become obsessed with your pancakes! And with Bob’s Red Mill! I LOVE to win the flour. 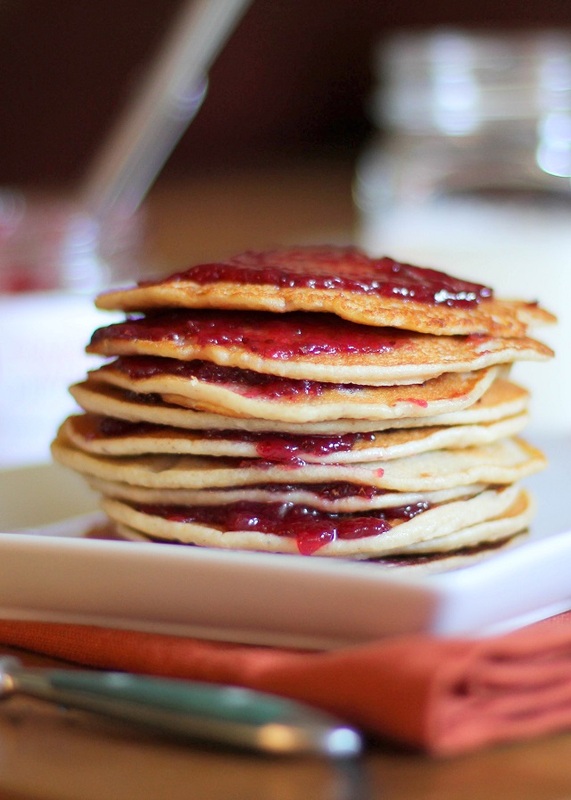 I’ve never used brown rice flour in pancakes or waffles before….GENIUS! Hope i win! Awesome idea! I have to say, I’m not the hugest fan of peanut butter & jelly sandwiches, but these look like a MUCH better version of the sandwich. Yum! I love me some PB and J! And I love that the pancakes are gluten-free! Not a requirement for my diet, but I am trying to consume less gluten as I think it messes with my tummy a bit. Yes! I agree with everything said here. 🙂 The jam between each layer looks like heaven! I love white rice flour but I know it’s not as healthy… This makes me more excited to try the brown! 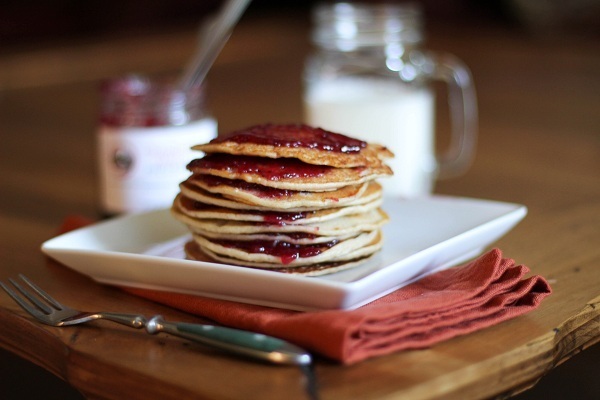 That stack of pancakes with jelly in between looks almost like a little dessert, so cute!